Situated on a bluff in the northern part of the Chihuahuan Desert, the tiny community of Lajitas silently overlooks the lumbering Rio Grande River. Lajitas is Spanish for “little flat rocks” — a reference to the Boquillas flagstone of the area. Long before Anglo-Americans arrived on the scene, this arid territory was inhabited first by Mexican Indians and later by the Apache and Comanche. The discovery of mercury in nearby Terlingua changed everything. Starting in the late 1800s, the populations of Lajitas and Terlingua surged as a steady stream of miners moved in to the area to work the mercury mines. Conditions in the mine were dangerous. Life in Lajitas was not for the fainthearted. Only the rugged survived. During the days of the Mexican Revolution (1910-1920), General John J. “Blackjack” Pershing established a large cavalry post at Lajitas in 1916. Pershing spent several years unsuccessfully pursuing Poncho Villa, the famous Mexican Revolutionary general, around northern Mexico. Pursuing anyone in the vast and unforgiving Chihuahuan Desert was a huge undertaking. 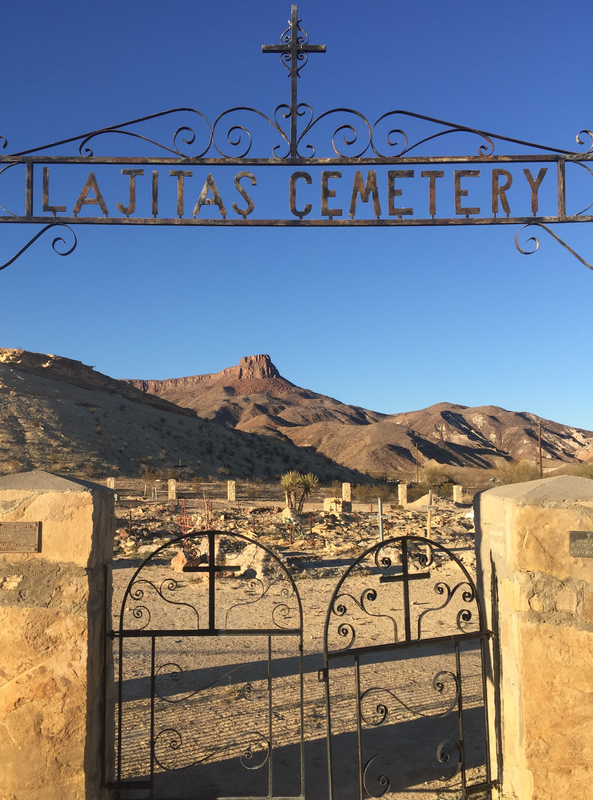 Today, the small Lajitas Cemetery is one of the must-see points of interest in the area. 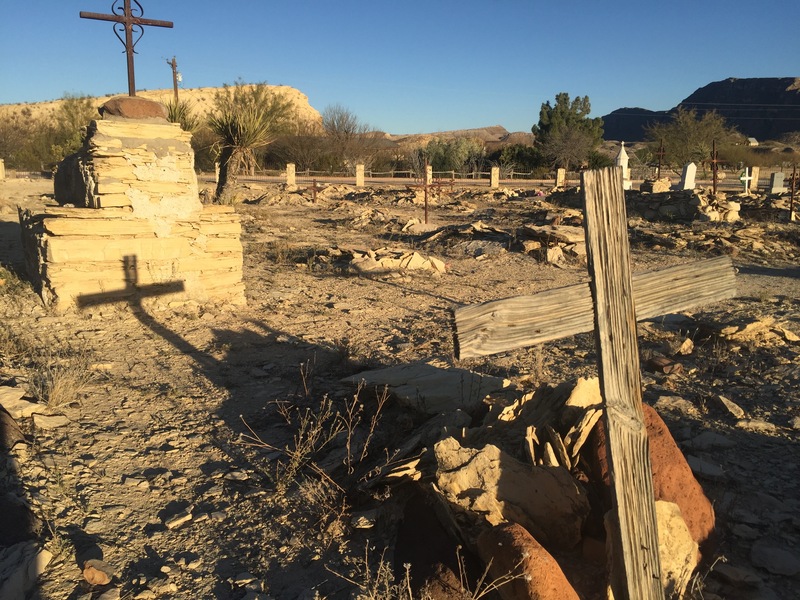 Like the nearby Terlingua Cemetery, this burial ground is filled with many fascinating old graves. Sadly, most of the names carved into handcrafted wooden crosses are no longer readable. Only the remaining descendants of the deceased know for certain who is buried beneath the rocky cairns. In 1991, a woman named Elie Webb initiated a restoration project at the cemetery. Under her supervision, a fence was built around the cemetery and a gate and arch added. Webb also added iron crosses to many of the graves. Today, however, even these improvements are losing the battle against the harsh desert environment. Old cemeteries like the one in Lajitas are worth visiting. 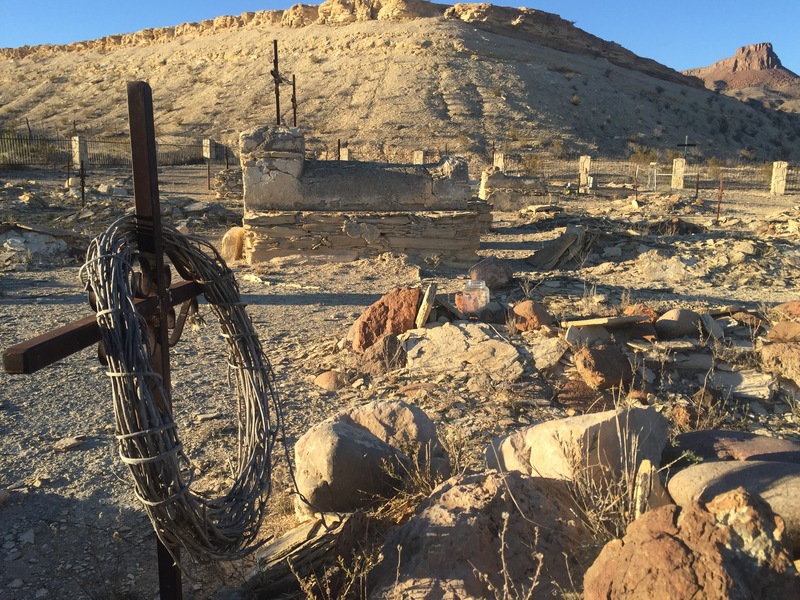 These old burial grounds are like dusty history books that can give us a little insight into what life was like in the days of cowboys, indians, and mercury miners. As you travel down Texas highways and byways, make it a point to stop at old cemeteries. These old burial grounds have their own interesting stories to tell. This entry was posted in Cemeteries, Interesting Texas Stuff, Small Towns. Bookmark the permalink.